The Betz sphere or Betz Orb thought by some to have extraterrestrial origin. The so-called ‘Alien sphere’ was discovered in 1974. After several tests, experts concluded that the object was a magnetic sphere sensitive to magnetic fields, numerous sound emissions, and mechanical stimulation. The sphere was able to withstand a pressure of 120,000 pounds per square inch, concluding that it was composed out of stainless steel, specifically magnetic ferrous alloy #431. The Betz sphere or Betz Orb, the object has never been fully explained by experts, even though countless theories have been proposed. Among many theories, there are some who suggest –that given the peculiar characteristic behind the artifact—it may be an extraterrestrial object. 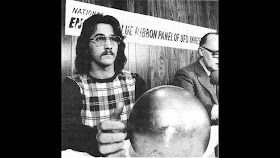 The United States Navy, as well as NASA, are said to have shown interest when the sphere was found, and even though the family refused to give the sphere to the Navy or NASA at the beginning, they ended up delivering the orb to the Navy due to the many unexplainable phenomena surrounding the sphere. In his six hours of testing, Dr Williston found that the sphere contained three magnetic poles and a possible fourth. Dr Carl Williston stated that the aspect of the magnetic field was a mind bender, the flux density of the field appeared to vary in strength based on an unknown pattern. An x-ray revealed 3 similar spheroid shapes within the ball. Curiously, these 3 shapes had a “halo” surrounding them, as though they were surrounded by a material with a different density. The metal was similar to stainless steel but had some unknown content making it slightly different.